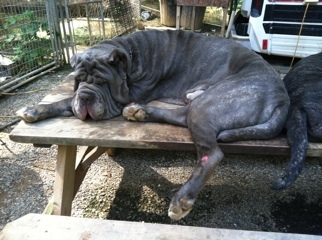 Magic is our dog, he is from our breeding. He is a beloved dog. He is not perfect, and we NEVER said he was. However, an absolute idiot, RETRIEVERMAN, posted about him, two years ago. And, stole my photo, and took credit for him. This is the photo he used. He said Magic has no expression. I think he has beautiful expression. He says he can’t see. He is looking right at the camera, at me. I’m talking to him. I could go on and on. I won’t. He is an absolute idiot. Nuff said. Wanted to warn people in the mastini world about this couple. We sold them a male out of Merlin x Venezia, about 3 years ago, and he died from osteosarcoma. We have never had any dogs, (that we are aware of), that have had this cancer. Research we have done, following this very unfortunate death, have shown that it could be genetic, or, it could be caused by microfractures, which could be caused by a bite. We had been contacted by Mr Garcia in regard to this swelling on the leg, and we recommended he take the dog to Dr Allen, unfortunately, he delayed treatment, because he thought it was an infection caused by his other neo biting Moose, (the dog we sold them). So, when Dr Allen did see him, the cancer was too far progressed, and the dog died. We offered to replace the dog, for nothing, but, because we felt horrible about Moose. So, we sent them the pick puppy out of PJ’s litter with Merlin. An incredible litter. 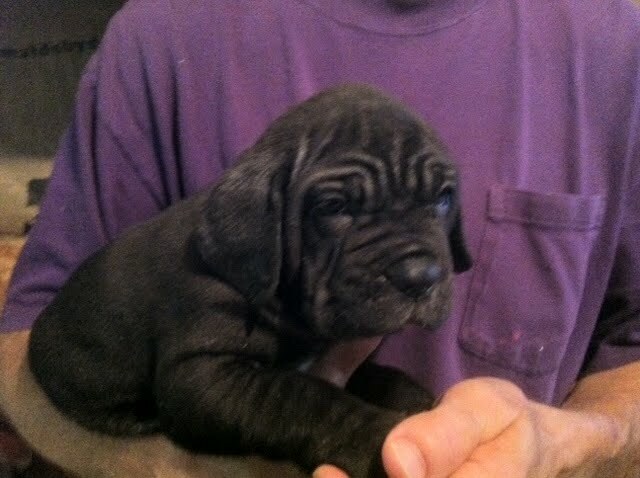 We have our Emma from this litter, and she looks just like her great grand dam, Prunella. We offered to provide the pup at no cost, but, they insisted on paying full price, because they liked our dogs. We sold the pick male for $2000. Much to our dismay, within a couple of months, Mr Garcia contacted us, and said Blue was limping. He also informed us of the food, and the care that he received. He kept this puppy on a concrete slab, underneath his deck, in a fenced in area. (ON CONCRETE, IN THE WINTER, A PUPPY!!!). Now, obviously, Bill told him to get the puppy off the concrete and in the house. (which we had been told is how he would raise Blue), and, at this point, we also found out he had raised Moose in the same way. We kept trying to get the pup back, and when we finally did, his joints were RUINED, btw, he was diagnosed with elbow dysplasia, by Dr Allen, who asked, as we had done, that the puppy be off the concrete! And, she advised high quality food, and medications, and supplements, and the Garcias ignored every one of her recommendations. So,this poor puppy stayed in these conditions for about 6 months. Outside, on concrete, Ole Roy food, no supplements. We sent a friend to meet Mr Garcia when he finally decided to return our puppy and wait for another litter, (yes, I told him I would replace Blue. I would have done anything to get my dog away from these assholes) And, Mr Garcia met my young, pretty young female friend, and he was so sexually suggestive in his convesation and interactions with her, that she was frightened. And, the vet records he supplied, were actually, the vaccines we had given Blue prior to our shipping him, to them!!! He received no vet care at the Garcias, until we insisted he be taken to Dr Allen. Blue is no longer with us. I blame the Garcias. I have to wonder if they are to blame for Moose’s death, also. So, no, we did not supply them with another male to ruin. And, it won’t happen. Yes, they did take us to small claims court, and we told our story, and the court found against us. The object of this post, is that we are warning anyone with a litter of neo pups to avoid the Garcias of New Jersey, like the plague. We lost our beloved Caesar to bloat on Friday of last week. Caesar was a wonderful neo, and he was a beloved family pet, and will be so missed. We have a beautiful litter here, on our mountain here in NC, out of Merlin and PJ! We believe it is the best litter produced here by Centurian since the founding of this kennel! 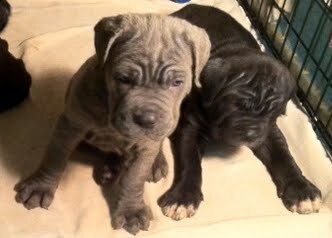 We plan on keeping a few of these pups to see how they do, and have placement plans already for a couple, we have two females looking for a great home!!!!! Wish us luck! My dad is doing better, checked on him, took his scripts to him, and he is feeling less weak. He is drinking gatorade, eating bananas, and applesauce, and is improving, slowly. Still hot, muggy, had to run to Asheville, to Sam’s. Asheville is a pretty eclectic community, and kinda hippyish. I love it! Saw all kinds of cool little shops, stopped at Earth Guild. Picked up flyer to buy some sheep. Won’t Bill be surprised, if he has to build a little barn for my sheep and goats! I love it here. People are so friendly, kind, compassionate. They offer to help, and mean it. Bill built some wonderful steps up the slope from the play pen, to the RV, and they are so nice, to be able to climb the slope, on steps, instead of walking around the long way, or…. hiking up the slope, with dogs tripping ya, LOL! Our new location will be so wonderful! Can’t wait to build the house. I hope it cools off soon, so I can help!